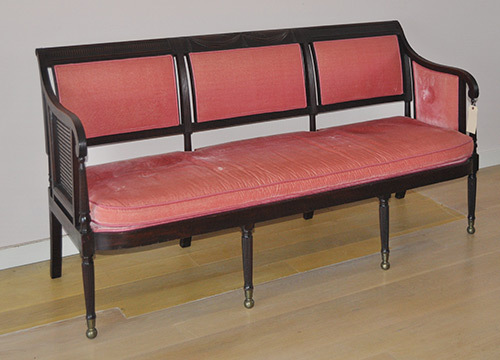 Woodbury, CT – On Tuesday, August 14th Schwenke Auctioneers held its August Fine Estates Auction with an offering of over 400 lots of estate property which included a broad selection of Asian decorative arts, American, English and Continental furniture and decorative arts, folk art and American country furniture, early English & other sterling silver, jewelry, fine art, miscellaneous decorative arts, and estate oriental rugs. The auction was a live online sale with absentee and phone bidding, plus live internet bidding on multiple platforms including live bidding on the firm’s own software. In fact, the top lot of the sale was from the Samowitz collection, a rare bronze mounted rosewood classical work table, attributed to Duncan Phyfe or Charles Honore Lannuier. 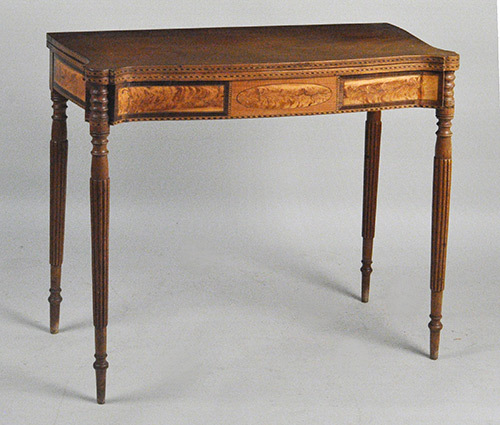 Dating circa 1820, the table had richly figured veneer and canted corners, applied bronze beaded detail throughout, the conforming two drawer base with original neoclassical hardware and exceptional neoclassical bronze mounts. Measuring 29 1/2" high, 23" wide, 17" deep, the table was claimed at $25,400 by an internet bidder, winning out over other internet bidders and six in-house phone bidders. 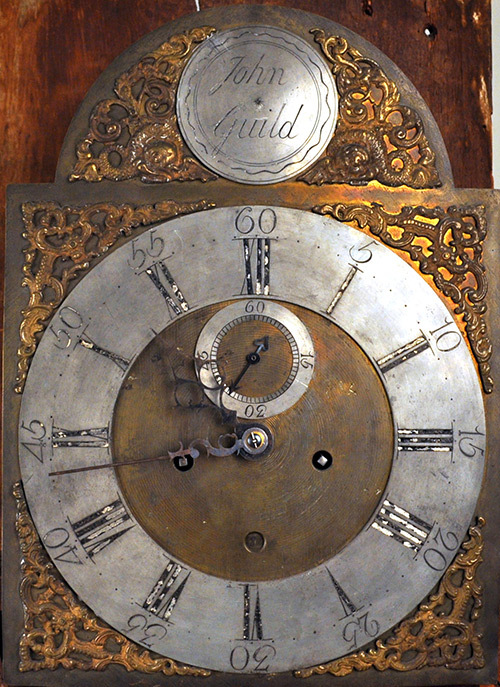 The next top lot at $12,200 was a New Jersey chippendale applewood tall clock with brass dial having silver boss and chapter ring, signed "John Guild" (1749-1825). Guild lived and worked in Pennington, Ewing Township, New Jersey, which is located in the southernmost part of Hunterdon County. Guild was both a clockmaker and a silversmith, as he made silver cups as part of a communion set for the Ewing Presbyterian Church. He was the son of Reverend John Guild (1712-1787) and Charity Hunt (1721-1766). 90 1/2" high, 17 1/2" wide, 9 1/4" deep. With provenance from a Connecticut collector, the clock went to one of four in-house phone bidders. 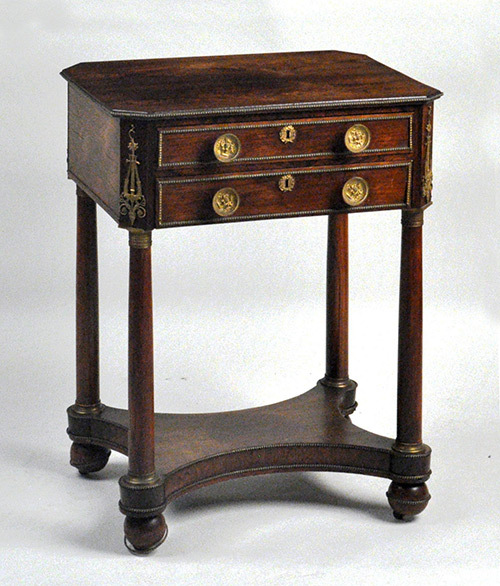 Also offered from the Samowitz estate was a very fine George III inlaid mahogany breakfront with rosette and floral/vine inlays, which fetched $4,800 from an in-house phone bidder. 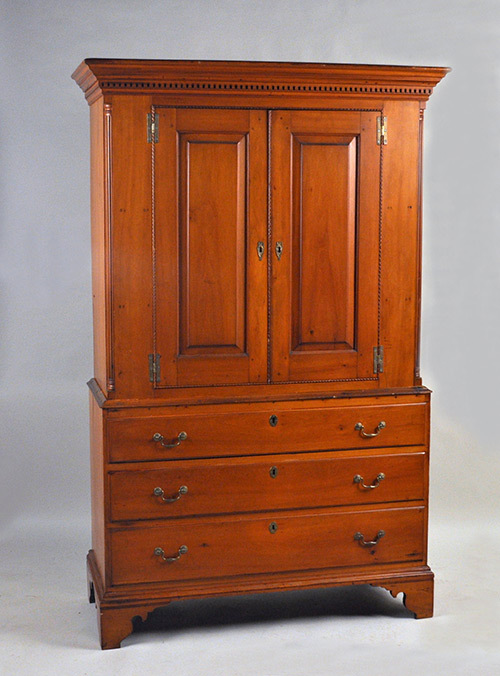 Other American furniture results of note include a very fine Connecticut Chippendale cherrywood linen press, consigned by the Westchester County Historical Society, which went out at $2,400 to another in-house phone bidder. The two part press featured a dentil molded crown above two paneled doors and a three drawer base with bracket feet, with unusual rope twist corner columns, and measures 48" wide, 79 1/2" high, 20" deep. 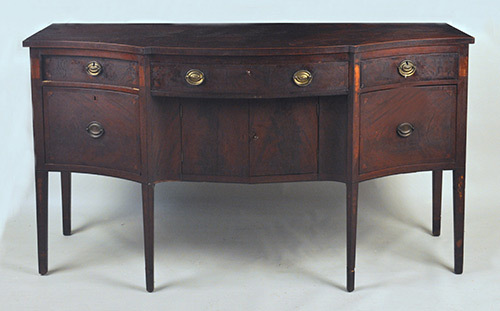 A hepplewhite serpentine sideboard “in the black” from a Wilton Connecticut estate sold for $2,300 to an in-house absentee bidder. And an unusual Stickley style 60” round rotating game or dining table fetched $2,400 from one of two determined in-house phone bidders. 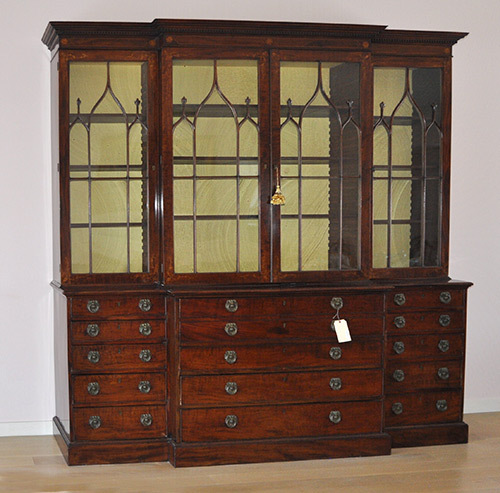 English and Continental furniture also performed well. A monumental early French oak refectory table sold to an internet bidder at $2,300. The table had a cleated three plank top on a turned base with two end drawers, and measured 30" high, 105" long, 35 1/2" deep, sold for a New Haven, Connecticut collector. Also from the estate of Gloria Samowitz was a fine English tall case clock, the hood with broken arch pediment and brass mounted columns, the case with engaged quarter columns, with a painted sheet metal dial signed "Fran De La Balle, London". The 92" high clock sold at $2,600 to a bidder on the phone. Other items of interest include a cased violin with label of "Gotthard Ebner Lauten 6 und Geigenmacher Music Fecit Ratisbonae 1750". Gotthard Ebner was an 18th century German violin maker who worked c. 1723 in Hallein Austria. The violin sold together with two bows, one stamped "Glasser", and went out to an absentee bidder at $3,200. Many lots of Asian decorative arts were offered, and the top Asian lot was also from the Estate of Gloria Samowitz, a pair of blue and white Chinese porcelain garden seats with enameled decoration of bats, various flowers and auspicious symbols. 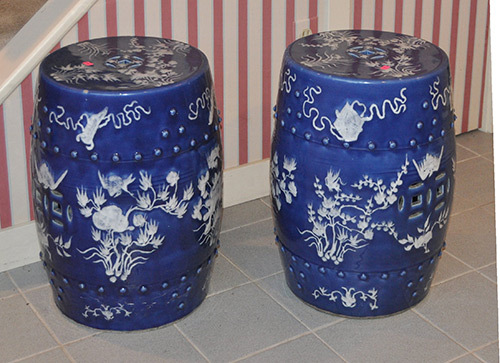 Measuring 19" high, 13 1/2" diameter, the pair went out to an internet bidder at $1,800. Oriental rugs are always offered last in the Schwenke sales. 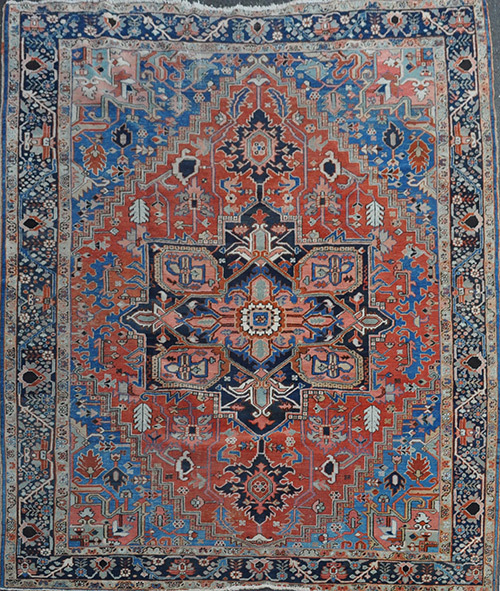 Several estate rugs were included in this auction, and the top selling rug was a Persian Heriz room size carpet, almost square at 10' 7" long, 9' 2" wide, which sold to an internet bidder at $2,800. The firm’s next catalog auction will be held in early October and will feature several important collections including Chinese porcelain from Florida and New York City estates. Photos may be emailed to consign@woodburyauction.com or potential consignors may call 203-266-0323 to discuss consignments.